Grand Central Station is arguably the most famous train station in the world. And throughout its time, there have been many a Grand Central Station clock to draw the eyes. They give the station style, a sense of nostalgia, and a vintage class that’s beyond compare. It shouldn’t be a surprise, then, that people love finding home decor that feels like it could be a Grand Central Station clock. Below are three selections all that do just that. 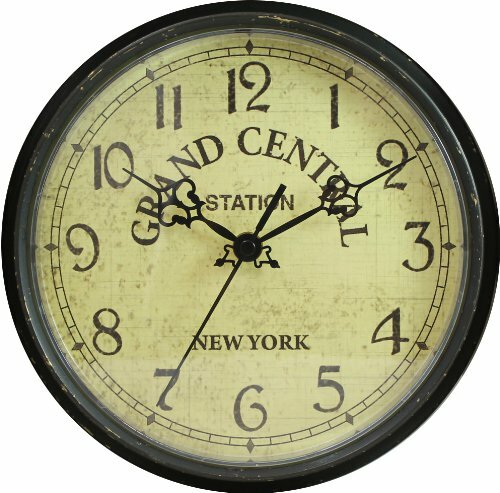 They, in fact, announce those terminal ties in writing – all feature the words Grand Central right on their clock faces.Whether you’re a lover of New York retro decor, railway decor, rustic decor, or simply vintage clocks, one of these Grand Central clocks is sure to add personality to your space. Like you’re standing on a Grand Central Station platform of old. Double-sided railway clocks are always excellent choices if your you want a station platform feel in your home. And this one amps up the style with of course the imprinted words Grand Central Terminal on the distressed clock face. This timepiece will work in the home of course, but it’s built to deliver in sunlight. The clock lights up using solar power. Plus, there’s a thermometer on one side of the two-sided timepiece so that you’ve got a lot of information right at your fingertips. It’s a retro cool clock that would look great on the side of a garage, on a covered patio, or in an entryway. Unique coloring and big. A stylish focal point for the wall. 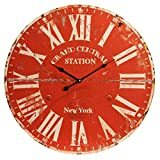 If you’re looking for a Grand Central Station clock for the home, you’ll usually come across clocks with antique parchment colored clock faces. Not here. 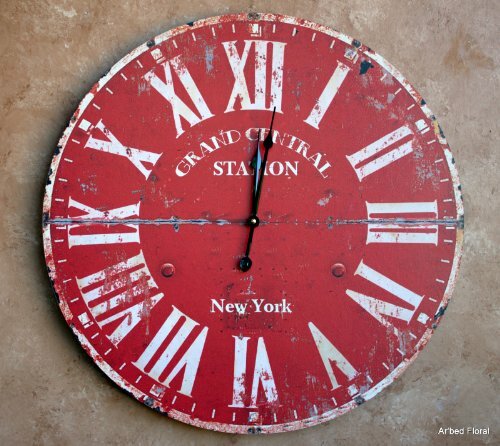 This is a unique clock all around, with its beautiful distressed red hue. It’s marked Grand Central Station across the middle, and the Roman numerals bring the full vintage style home. This is a large wall clock, measuring nearly two feet across. Between that and its surprising splash of color, it’s a good one to anchor a wall style with, especially in rustic living rooms, dens, and offices. 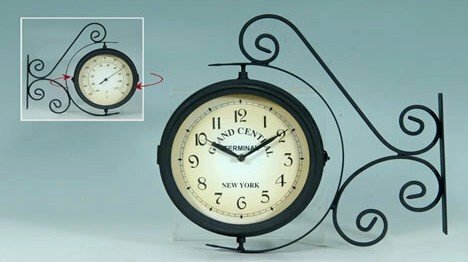 A budget-friendly Grand Central wall clock choice. 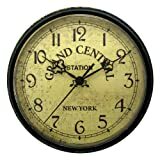 If you’re on a budget or you’re looking for an inexpensive gift with some style, then this is a top Grand Central Station clock choice. In fact, there are few station clocks out there with specific terminal ties at this price. It’s made from plastic, but its antiqued parchment face and ornate clock hands give the clock a total vintage Grand Central Station vibe.